The group points out that Government policy is creating a perfect storm of high private rents, insecure contracts, shortage of council homes, privatisations and selloffs and savage benefit cuts. This is increasing homelessness and eviction threats, dire poverty, hunger, cold and insecurity, and a miserable future for generations. 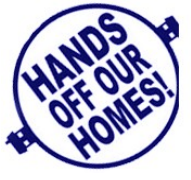 Leeds Hands Off Our Homes is inviting all activists to the meeting and want to build a huge campaign to reverse these attacks, and push for policies which let councils build genuinely affordable, socially rented homes, for local need instead of private profit.